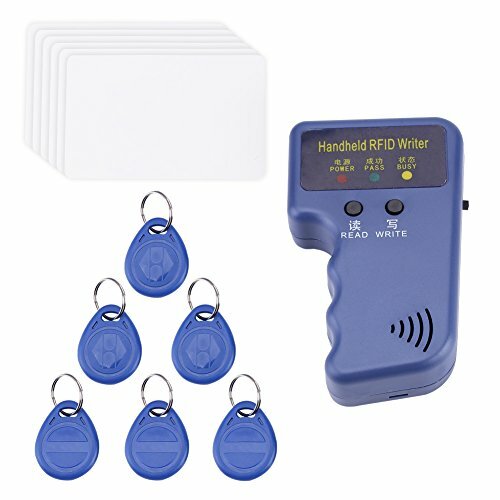 Thing need consider when find rfid writer reader? Still think it is inconvenient to go in and out of places with restricted access such as offices, residences, and elevators? If so, just come and choose our handheld RFID Writer,ID cards and ID tags to make your access easier! Xinrub have professional customer service and will try our best to help you.If you have any questions,don't hesitate to contact us. 1.Push power switch on the right of device, it will keep two or three times, and LED is on mean it works, if not restart please. 2.Put the other card near the antenna left of the device, and then press READ button,the device will keep and the LED is on when read successful, if beep 2 times go to step 3, if beep 3 times go to step 4, click READ again if it doesn't beep. 3.change an new blank card as T5557/EM4305, then press WRITE button, when beep PASS LED is on mean clone successful, if it doesn't beep and light please write again. 4.Change a blank T5557, then press WRITE button, when beep PASS LED is on mean clone successful, if it doesn't beep and light please write again. 5.Repeat step 3 or step 4 if you want to make more same ID card. 6.Switch off for save power.